Born ABT 1490, third surviving son of Thomas Fitzwilliam of Aldwark and Lucy, dau. and co-Heir of John Neville, Marquess Montacute. Kntd. 25 Sep 1513; KG nom. 24 Apr, inst. 6 May 1526; cr. Earl of Southampton 18 Oct 1537. Gent. usher 1509; King's cupbearer 1509; esquire of the body 1513, knight by 1515; j.p. Surr. 1514-d., Mdx., Kent 1520, nearly all counties 1531-d.; v.-adm. 1520, 1522-3; Ambassador to France Jan 1521-Jan 1522; Councillor by Apr. 1522; jt. master of ordnance, Calais 1522; capt. Guisnes 1523-6; lt. Calais castle 1526-30; treasurer, Household 1525-39; chancellor, duchy of Lancaster 3 Nov 1529-d.; high steward, Oxf. Univ. 1532-d.; commr. tenths of spiritualities, Surr. 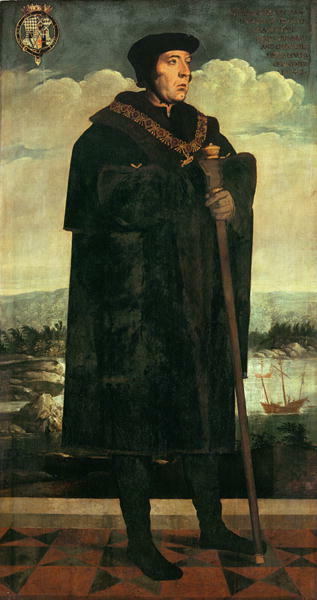 1535; ld. adm. 1536-40; trier of petitions in the Lords, Parlts. of 1539 and 1542; ld. privy seal 1540-d.; lt. and capt.-gen. in the north 1542; numerous minor offices. His elders brothers, Thomas and John, died al Flodden Field in 1509; Fitzwilliam was also half-bro. of Sir Anthony Browne. William Fitzwilliam, a younger son in a cadet branch of a relatively undistinguished Yorkshire family, was probably chosen at the age of ten as a companion for Prince Henry as a result of his mother's second marriage to Sir Anthony Browne, the King's standard-bearer and constable of Calais. After receiving a sound education with the prince he passed the first ten years of Henry VIII's reign as an athletic young courtier, increasingly employed in positions of trust. In 1512 he took part under Thomas Grey, 2nd Marquis of Dorset, in the abortive invasion of Guienne and followed this with service in the fleet under Sir Edward Howard; in the brave but reckless action off Brest which cost the Admiral his life Fitzwilliam was ‘sore hurt’ by a crossbow. He next went with the King to France, leading a company of the King's guard, and in Sep was knighted at Tournai. In Nov 1513 the King attended his marriage to Mabel Clifford, dau. of Henry, 10º B. Clifford, "the Shepherd Lord", by his first wife, Anne St. John. Mabel was Gentlewoman to Catalina of Aragon. He had no sons by Lady Mabel, but had at least one illegitimate son. Fitzwilliam's career during the years which followed is liable to confusion with that of a namesake, the treasurer of Wolsey's household: both were associated with Calais and both became members of the Council, but it was probably the courtier who was appointed to sit in the Star Chamber in 1517. By 1520 Fitzwilliam was vice-admiral to the Earl of Surrey and as such was responsible for fitting out the transport to the Field of the Cloth of Gold and providing a convoy for the King's own passage. He attended the King both on that occasion and at the meeting with Carlos V at Gravelines in the following Jul. He had taken his own first steps in diplomacy in 1518, accompanying the embassy to France headed by Charles Somerset, 1st Earl of Worcester, and the Bishop of Ely. In Jan 1521 he replaced Sir Richard Jerningham as resident Ambassador there. He gave high satisfaction to Wolsey, who praised him to Henry VIII, and the King himself congratulated Fitzwilliam on ‘the diligent and substantial acquittal’ of his task. His long-awaited recall came in Jan 1522 after an attack of colic and fever. On his return Fitzwilliam was promptly immersed in preparations for war against France, his special responsibility as vice-admiral being to prepare the ships at Portsmouth. He was in the force led by the Earl of Surrey which burned towns, villages and castles from Calais to Picardy. When criticized in the following year for failing to set sail he wrote a spirited letter to the King saying that he could not make ships sail without wind, or cables hold where they would not, ‘and in case my lord admiral can, I would be right glad to learn in that behalf’. In Jul 1523 he defeated a Scottish-French squadron off Boulogne and ravaged the French coast but failed to stop the Duke of Albany's passage from France to Scotland. Although Wolsey thought that he had done all he could, Fitzwilliam wished he had done more: the Scots had killed his two elder brothers at Flodden, and he would have been glad, he said, ‘to do the Scots some displeasure for their cracks and high words’. In 1522 Fitzwilliam had been appointed joint master of the ordnance at Calais and in 1523 captain of Guisnes. In May 1525 he was sent with Sir Robert Wingfield on a special embassy to Margaret of Savoy to convey Wolsey's latest notion, the partition of France, and in Sep he went with Dr. John Tayler to Louise of Savoy to receive her oath of ratification to the treaty of the More. When Fitzwilliam again fell ill and was recalled, Tayler explained to Wolsey how deeply his loss would be felt, as ‘a wise, discreet and sober man’ who ‘hath the language of the French tongue’. By Oct 1525 Fitzwilliam had become treasurer of the Household and by 1526 a member of the inner ring of royal Councillors. His ascendancy was confirmed by his admission to the order of the Garter in 1526, and in the same year the city of London admitted him to the freedom ‘in whatever mystery or craft he likes, paying nothing’. His next appointment, as lieutenant of Calais castle, meant that he could be readily sent on embassies to France; he was there in 1526-7 trying to negotiate a closer alliance and to promote a marriage for Princess Mary, and again in 1529, this time with the Duke of Suffolk, to forestall a peace which would lessen the chance of obtaining the King's divorce. During Wolsey's last years of power Fitzwilliam stood close to the Cardinal, acting as his channel of communication with the King. Their relationship was not purely official: Fitzwilliam sent Wolsey a gift of his wife's ‘housewifery’, ‘made him good sport’ in Windsor forest and undertook to cover up for the minister if he failed to attend to the matter of a household appointment. He none the less subscribed to the articles presented by the Lords as did More and others of the Household; article 12, which charged Wolsey with conducting diplomacy single-handed, Fitzwilliam signed separately, but as he had been personally involved he could hardly deny its truth even if the implication of deceit was unfair. He was present when Wolsey surrendered the great seal. As late as the following Jun he was among those at court who were still ‘asking heartily’ after the Cardinal. Fitzwilliam's career in the Commons may well have begun in 1523, or even earlier, but the loss of names for these Parliaments leaves this a matter of speculation. His election in 1529 as knight of the shire for Surrey must certainly have had the King's approval, if indeed it was not the King's doing: Fitzwilliam was probably with him at Windsor when delivery of some of the writs was being arranged, and unlike his fellow-Member Sir Nicholas Carew he had as yet no strong affiliation with the county. What little is known of his role in the House suggests that it was chiefly that of spokesman for the crown, although in 1531 he helped Southampton to secure an Act (22 Hen. VIII 20) reducing its fee-farms. When in the course of the first session the House complained to the King of Bishop Fisher's imputation that Members were heretics, it was Fitzwilliam who brought back the King's answer, ‘which blind excuse pleased the Commons nothing at all’. He was one of the knights and doctors in Parliament who signed the petition of Jul 1530 to the Pope for the divorce and he was present at Westminster when the clergy made their submission in May 1532. As ‘Mr. Treasurer’, he was included in a list compiled by Cromwell probably in Dec I534 and thought to be of Members connected with the treasons bill then passing through Parliament. In 1535 he visited Calais with his former commander Surrey, now 3rd Duke of Norfolk, and the results of this and earlier commissions of inquiry were incorporated in a bill prepared by Fitzwilliam and enacted in the last session of the Parliament (27 Hen. VIII, c.63). During the following Parliament his presence in the House was noted when another Calais matter was debated and towards its close John Hussee observed that Chancellor Audley, Cromwell and Fitzwilliam had all been too preoccupied with ‘the weighty matters of the Parliament’ to settle a dispute over an office there: his constituency is unknown but he had almost certainly been re-elected for Surrey in accordance with the King's request for the return of the previous Members. 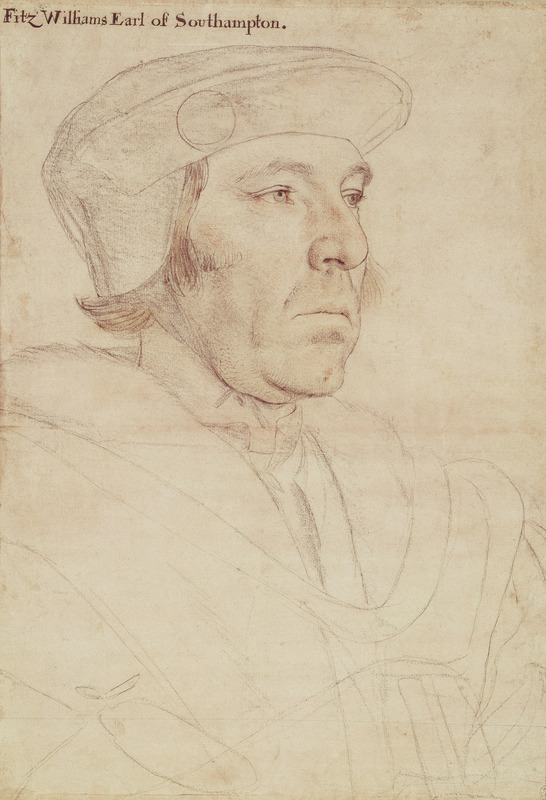 Fitzwilliam's duties in the Household were not onerous, and he was appointed in turn to greater and more demanding offices: in 1529 he succeeded More as chancellor of the duchy of Lancaster, in 1536 he replaced the Henry Fitzroy, Duke of Richmond as admiral and in 1540 he followed Cromwell as lord privy seal. If his unbroken progress is proof of his ability to avoid pitfalls, his attitude towards the great issues of these years is, perhaps understandably, less clear. It was as a ‘very friend’ of Cromwell that he was asked by More to intercede with the minister in 1533, whereas Chapuys took him to be ‘a good servant of the Princess Mary’ and a secret opponent of the divorce. To this piece of wishful thinking Fitzwilliam's conduct lent little or no colour: in 1530 he was sent with Suffolk to cajole or bully the university of Oxford into support for the divorce, in 1531 he was one of the Councillors who exhorted the Queen not to make her appeal to Rome and two years later he witnessed the King's appeal to a future general council against his threatened excommunication. Only during the tense summer of 1536 was he momentarily at risk: as one of the commissioners who had sought vainly to persuade the Princess to submit he incurred the King's anger and was for a time excluded from the Council. He redeemed himself by the vigour with which he acted during the Pilgrimage of Grace, and in the following year he was ennobled. A certain ruthlessness, allied to cunning, also marked Fitzwilliam's dealings with offenders of higher degree. Henry Norris complained that Fitzwilliam had tricked him into a confession of Anne Boleyn's adultery. In 1538 he interrogated Sir Geoffrey Pole and his mother the Countess of Salisbury, and 18 months later it was Cromwell's turn to face him. His last such investigation was that of 1541 when with Thomas Wriothesley he inquired into Catherine Howard's upbringing. In 1539 Fitzwilliam had been in charge of the mobilization of the country in case of invasion, a task which he combined with that of supervising the choice of Members to the Parliament of that year in Hampshire, Surrey and Sussex. His reports to Cromwell show that, while aware that Godalming and Petworth were not parliamentary boroughs, he believed the Bishop of Winchester's borough of Farnham to be one although it is only known to have made an isolated return in 1460. Fitzwilliam became a regular attender in the House of Lords. As admiral in 1540 he introduced the measure enacted as the Navigation Act (32 Hen. VIII, c.14). In the same year he was one of the committee which dealt with the Commons over the nullity of the Cleves marriage, and on 11 Feb. 1542 he reported for the commission from the Lords which, on Audley's suggestion, visited Catherine Howard before her attainder. In 1539 he went to Calais with his guard George Talboys and with Sir Peter Carew (both will be husbands of his cousin Margaret Skipwith) to received Anne of Cleves, whence he wrote to the King in praise of her beauty. Henry VIII's disappointment nearly cost Fitzwilliam his reputation and standing, although he made the excuse that it would not have helped to disabuse the King at so late a stage. It was Fitzwilliam whom the King sent with Suffolk and Wriothesley to tell the Queen of his wish for a divorce, and in the subsequent proceedings he was a witness that the King lacked the will and power to consummate the marriage. As lord privy seal Fitzwilliam signed Anne's letters of consent to the divorce and afterwards assisted her to establish her own household. Fitzwilliam greatly augmented the inheritance he had received from his father and mother. His principal seat, Cowdray, he bought in 1528 for nearly £2,200 although he did not occupy it until 1535. At the Dissolution he received the entire holdings of Boxgrove priory, Durford priory, Easebourne nunnery, Shulbrede abbey and Waverley abbey, and had a lease of Chertsey abbey lands. In 1537 there followed grants of lands in Devon, Northamptonshire and Somerset, and in 1540, after the attainder of the Countess of Salisbury, of her manors of Chalton and Warblington. His first town house was in Cannon Row, but in 1539 he acquired the Bishop of Bath's house in the Strand, a transaction confirmed by Act of Parliament (31 Hen. VIII, c.25). The value of his property after the Dissolution has been estimated at over £1,000 a year, to which must be added his income from wardships, fees and offices. To the North of Laughton lies the hamlet of Slade Hooton, which appears in the Doomsday Book as a manor within the Soke of Laughton with 3 carucates of land. In the Middle Ages it was divided into 2 manors. The Ripers family, Lords of Loversall gave their manor to Roche Abbey. At the Dissolution this manor was granted to Richard Turke who sold it to Robert Saunderson. William Fitzwilliam, Earl of Southampton held the other manor in the early 16th century. He gave Slade Hooton and other lands in the area to John Fitzwilliam of Kingsley (Hants). This grant was later challenged by the Earl's niece, Margaret, wife of Sir Godfrey Foljambe and the case was settled in 1563 in favour of Godfrey Foljambe of Croxden. Fitzwilliam died as he had lived, on active service. Appointed to command against the Scots in 1542, he had to travel to Newcastle in a litter and died on 15 Oct, three days after his arrival. In the will which he made on 10 Sep he had asked to be buried, if he were to die within 100 miles of Midhurst, in a new chapel to be built in the church there: the chapel was built, but without a tomb. St Nicholas Church (now the cathedral, and emptied of its old monuments) in Newcastle, has a resurrection chapel. This church in Newcastle is where Sir Anthony Browne took the body of his half brother by Lucy Neville, after he had been killed there, although it is not known where he was buried. In his will, dated 10 Sep 1542, he lists: Mabel, his wife; Lady Lucy Browne his mother; his cousin Thomas Harvey; Mabel Browne dau. of his half-brother; his half-brother Sir Anthony Browne; his cousin Elizabeth Borough; his cousin lady Catherine Heneage, wife of Sir Thomas Heneage; his nephew John Cutts; his nephew William lord Herbert; his cousin Margaret Foljambe. His heirs were a niece and a great-nephew Godfrey Foljambe. To the King, whom he appointed his overseer, he gave his ‘great ship with all her tackle and apparel and also my collar of the Garter with my best George and a tabernacle of silver and gilt beset with stones and mother of pearl’, and to his friends, relations and household servants he made gifts of money and plate. His lands, which included, besides such further Sussex property as the manor of Midhurst, some 4,600 acres in Hampshire, were to pass to his half-brother Sir Anthony Browne on the death of the widow, Mabel Clifford. Although Browne died before the Countess, he had already come into possession of at least one of these estates, Cowdray, which was to become the family seat. D. F. Vodden, ‘The corresp. of William Fitzwilliam, Earl of Southampton’ (London Univ. M.Phil. thesis, 1972). W. C. Richardson, Tudor Chamber Admin. C. M. Clode, Merchant Taylors’ Co.
Elton, Tudor Rev. in Govt.